Putting the X in Extreme! like rock racing and extended hill climbing,we recommend you run the Mamba X ESC with the same motor. Your ESC will come with our new V2.02 firmware that has been enhanced for rock crawling and sensored operation. Use of an external BEC is recommended if running a high power or digital servo. compatible transmitter. Try out the brand new Crawler Mode for incredible versatility! 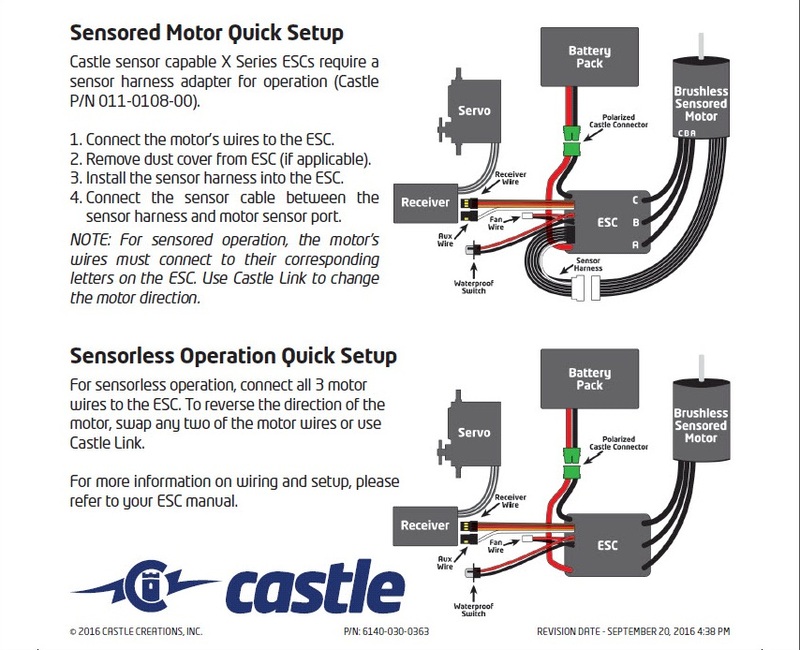 The Mamba Micro X is telemetry ready, which means owners of FutabaT4PX or 7PX Transmitters will be able to purchase the Castle Telemetry Link for S.BUS2. data provides another level of protection and can increase performance. Connectors: 4mm male Castle Bullet Connectors attached to replaceable 16 gauge wire; includes Castle sensor harness. Items Needed for Operation: Battery Connector required, Castle 4mm polarized Connectors, Deans Ultra Plugs, or Traxxas Power Connect are recommended. Recommended battery capacity is at least 1500mAh and 25C. Castle recommends running the highest mAh that will fit in your vehicle and the highest C rating you can afford. The Crawler Edition Mamba Micro X has solder posts for the motor connections; includes 13 gauge wire with 4mm female bullets that connect directly to the included 1406-1900kv motors and the battery input wires are bare. You must solder the connector to the wires on the ESC. See Items Needed for Operation for recommendations. Application Guidelines: Low speed crawling or trail running in vehicles weighing up to 8lbs. If you're looking for a more aggressive setup, like rock racing and extended hill climbing it is recommend to run the Mamba X ESC with the same motor. Recommended Motors: Combo includes 1406-1900kv sensored brushless motor. Max. Recommended Vehicle Weight: 8lbs when used for low speed/moderate driving style; 4lbs for more aggressive driving styles. Tech Notes: *Not intended for operation while submerged in liquid. If unit is operated in wet conditions, rinse with fresh water to remove dirt or corrosives, then fully dry unit. Optional 5mm rotor replacement available. Application Guidelines: Ideal for 1:10 scale low speed rock crawlers/trail runners on 2S-3S weighing less than 8lbs. Can also be used in more aggressive setups in lighter 1:10 scale touring cars, stadium trucks or buggies weighing up to 5lbs. 4lbs for more racing and aggressive driving styles.